Community Financial Money Matter$ Blog: Which U.S. President Would You Have Lunch With and Why? Which U.S. President Would You Have Lunch With and Why? Every president had his own favorite meal, Ronald Reagan loved his home-style mac and cheese and Bill Clinton has a penchant for authentic enchiladas. It’s no surprise that the Commander-in-Chief eats well at the White House, but which president would be the most interesting to spend time with at lunch? 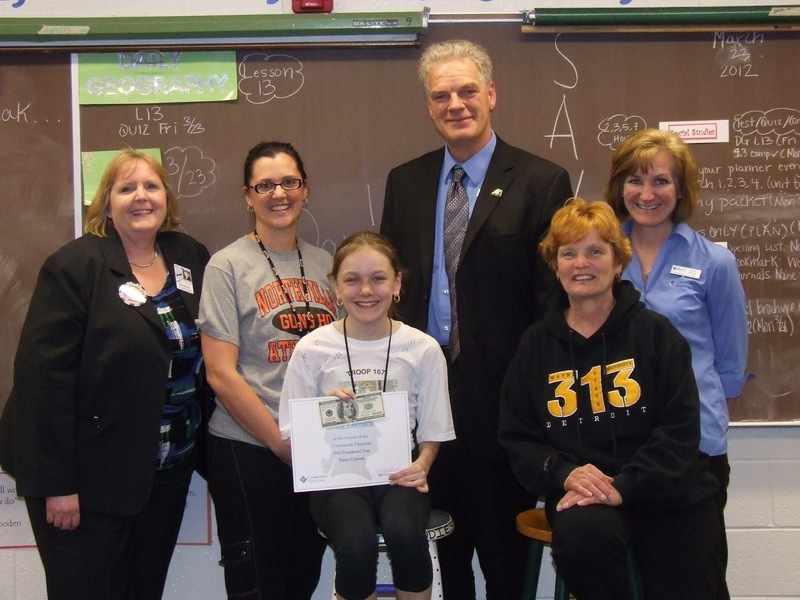 That’s the question being posed to local 4th and 5th grade elementary and 6th thru 8th grade middle school students in Community Financial’s annual essay contest in honor of Presidents’ Day. From now until the holiday, February 18, essays are being accepted at all Community Financial branches from students as part of a contest asking which President – from George Washington to Barack Obama – they’d like to enjoy lunch with and why. The top essay in each of two age categories will receive a $100 gift certificate while five finalists in each of the group will also receive $10 Subway gift cards. The two winners’ teachers will also receive a $100 gift card to be used for supplies in their classroom. In addition to the gift certificates, the two winners in each age category will be treated to lunch with their classmates and Community Financial President Bill Lawton. Essay forms are available online at www.cfcu.org/contest. Last year’s winners were Emily Loebach of Meads Mill Middle School in Northville, who wished to have lunch with former President Abraham Lincoln, and Julie Shen of Miller Elementary School in Canton, who chose President Thomas Jefferson. 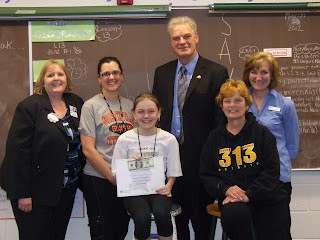 Mary Kay Gallagher, Superintendent of Northville Schools, Amy Soukup, teacher, Emily Loebach, essay winner, Bill Lawton, President of Community Financial, Susan Meyer, Principal of Meads Mill Middle School, and Mary Kerwin of Community Financial after last year's contest.